It’s easy to overlook vehicle maintenance until something goes haywire. However, rather than wait until it’s too late, it’s beneficial to focus your New Year’s efforts on taking care of your vehicle which in turn, will be better on your wallet going into 2017. In addition to obtaining the best Ann Arbor Auto Insurance, here is how to start the new year off right with your vehicle. Get your car into shape. Much like people, a vehicle benefits from being in good shape. simple vehicle maintenance regime — including measuring your tire pressure, checking for leaks once a month, taking your vehicle in for regular tune-ups and reading the owner’s manual — will help you save money and fuel, and protect the environment. 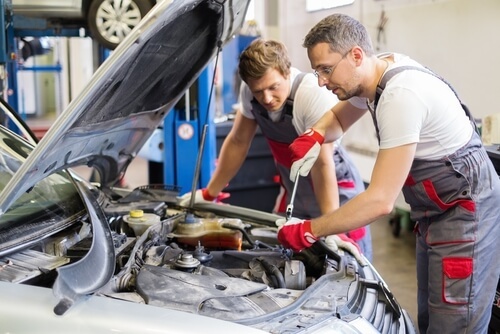 Maintenance regimes vary widely from one vehicle to another so check with the manufacturer of your vehicle and find a trained automotive professional to tune up your vehicle, explains Green Living Online. Aggressive driving is not only dangerous, it reduces fuel efficiency by up to 35 percent. Slow down, allow plenty of time to get to your destination, and plan where you’re headed in advance to increase fuel efficiency. Keep an eye on your tire pressure. Especially during winter, your tire pressure is going to need plenty of attention. Measure tire pressure regularly, especially after a sharp drop in temperature. Operating a vehicle with just one tire under-inflated by 8 psi (56 kPa) can reduce the life of the tire by 15 000 kilometers (9,320 miles) and increase the vehicle’s fuel consumption by 4 percent, explains the article. At Thayer-Innes Insurance Agency and Freeman Bunting Insurance Agency, we strive to protect your vehicles with comprehensive packages and we pride ourselves on serving Washtenaw County with affordable and customizable policies. For more information about our products, contact us today at (855) 395-6316.